The amazing Goldie Hawn has literally been entertaining the world since the ’60s, yet she hasn’t made a movie in a whopping 14 years. 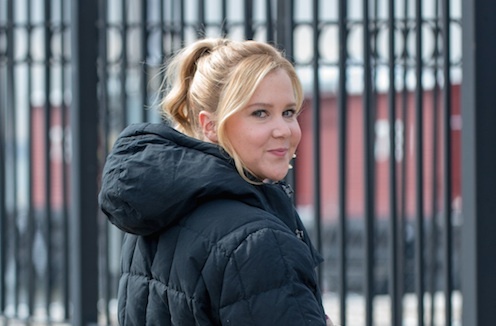 But if anyone could coax a legend out of retirement, it’s Amy Schumer. According to an interview with the LA Times, Schumer met Hawn on an airplane a couple years ago, and told her she wanted to make a movie together. “And she was very nice. ‘OK, honey.’ She probably thought I was a psycho. “OK, crazy person,” Schumer said. But Schumer was persistent, and said that every time they met on subsequent occasions, she would bring up the movie and how they had to make it together. “I think, eventually, some people got in her ear and told her I wasn’t crazy, that I make things,” she said. And from there, a collaboration was born. According to Schumer, the movie is slated to be an action comedy, and Hawn will be playing the role of Schumer’s mom. Schumer co-wrote the script with sister Kim Caramele and The Heat/Ghostbuster writer Katie Dippold. Umm, sounds like the comedy team of our freaking dreams! And what’s the movie about, you ask? We’re officially going to be first in line to what is sure to be this LEGENDARY collaboration!